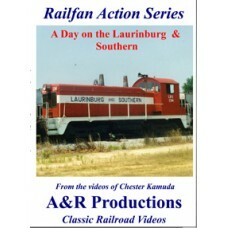 The Laurinburg & Southern RR was chartered in the early 20th century in North Carolina. It runs from Laurinburg to Johns and from Laurinburg to Raeford in the north. Interchange is with CSX on the former Seraboard Air Line in Laurinburg and the Aberdeen and Rockfish at Raeford. It is a busy line with two major customers. One is a large plate glass industry and the other is an elevator providing feed for the turkey and hog business in the area. They operated with three EMD switchers, including two SW-1's. Chester Kamuda video taped the operation and got cab rides. The little road had semingly too many car loads and not enough track!